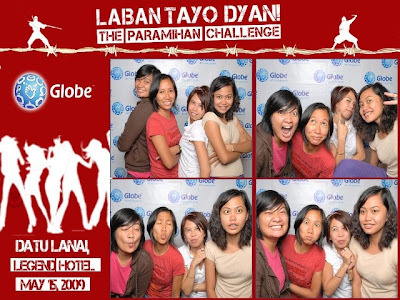 Last May 15, our friend Coco invited us to this Globe Paramihan event. At first I didn't know what it was about, all I know was that any bloggers were welcome to join. And so together with Kimi, Yes and another officemate, Arlene, we went to Legend Villas for the said event. They were promoting the Everybodytext, which is Globe's new offering for us Globe subscribers! It's nice cos all you have to pay is 20 pesos but you will receive a 200-worth of globe-to-globe texts and free 20-peso texts to other network. Boy was I happy that I came? SUPER LANG! This was the first thing we did: Photobooth! Yay! When we arrived, the hosts were giving away PhP500 worth of Globe prepaid. Too bad we didn't win (he didn't get to our table boohoo). The food was so great, I loved the desserts. But there was another surprise in for us, we will have a chance in winning PhP20,000 if we participate in their Paramihan Challenge. What will we do? We have put as many people as possible in an inflatable kiddie pool. Sounds easy right? Not if you are there. My goolay, it is so HOT inside, everyone's grabbing anything they can hold on to. Plus I kept on falling out of the pool but good thing there were people holding our backs, literally. 36 people made it inside that small kiddie pool. NYAY. The managers added up PhP 16,000 more so that each of us will have a thousand bucks each. Not bad to earn your 1k. ILOVESIT. Thanks Coco! Til next time hehe.